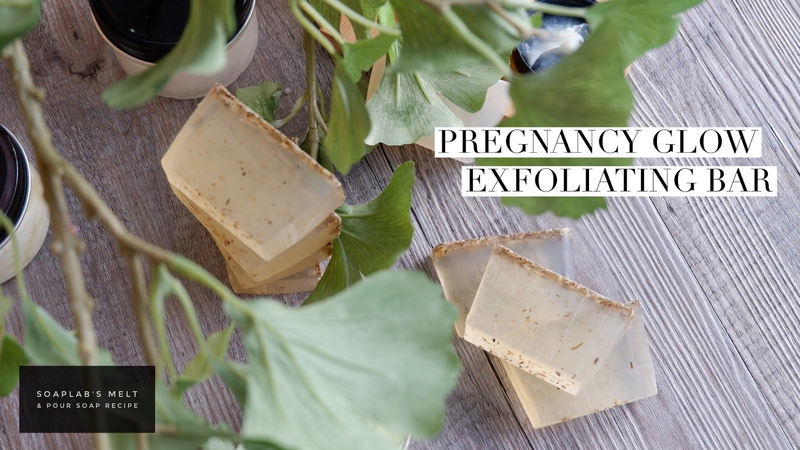 Hey everyone, today's recipe is the Pregnancy Glow Exfoliating Bar. During pregnancy, your skin tends to be more sensitive and might go through some changes. Its very common due to the hormonal changes thats happening inside your body. You are after all ‘making’ a cute human inside:-) Therefore, you have to be more careful about the products that you apply on the skin. If you are experiencing duller skin tones, use this recipe to rejuvenate your skin and get that beautiful pregnancy glow. The bar uses a SoapLab’s Handmade Papaya Soap Base which is much gentler on the skin. Its milder than most commercial soaps and it helps retaining the oils on the skin. Plus it contains papaya extract thats perfect for sensitive and inflamed skin. Next we added lemon extract and dried herbs. The vitamin C in the lemon extract promotes healthy, glowing skin while dried herbs provides an all around skin care. Dried herbs is added in here to give you this gentle exfoliation properties. when you shower; these herbs will act as a scrub. not the normal harsh ones you get outside. very gentle and soft you almost cant feel it! Finally, for a soothing aroma add green tea fragrance oil. With this exfoliating bar, you will be able to maintain a beautiful radiant glow.